For my husband’s 40th birthday, I threw him a big party at the house with a bunch of our friends. 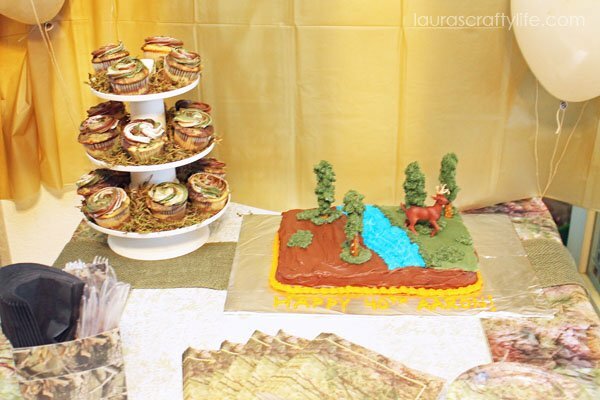 My husband is a hunter and loves the outdoors, so I thought doing a camouflage birthday party would be fun. 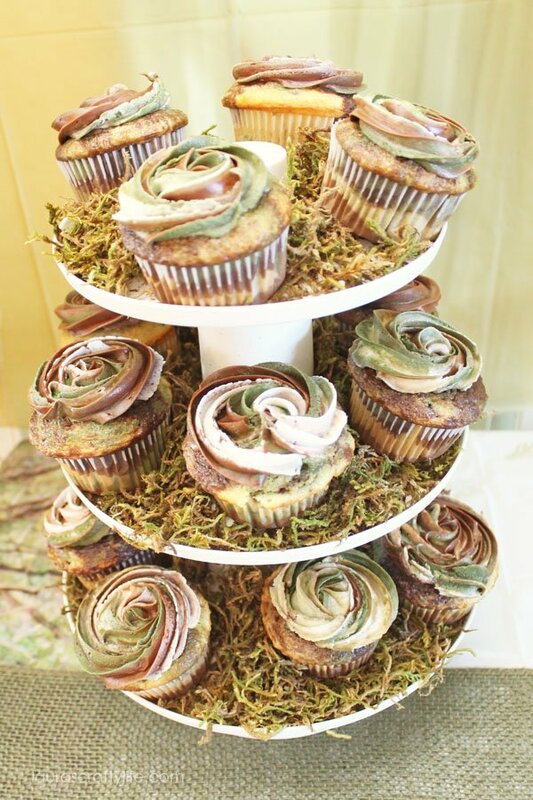 The real star of the party was the camouflage cupcakes. 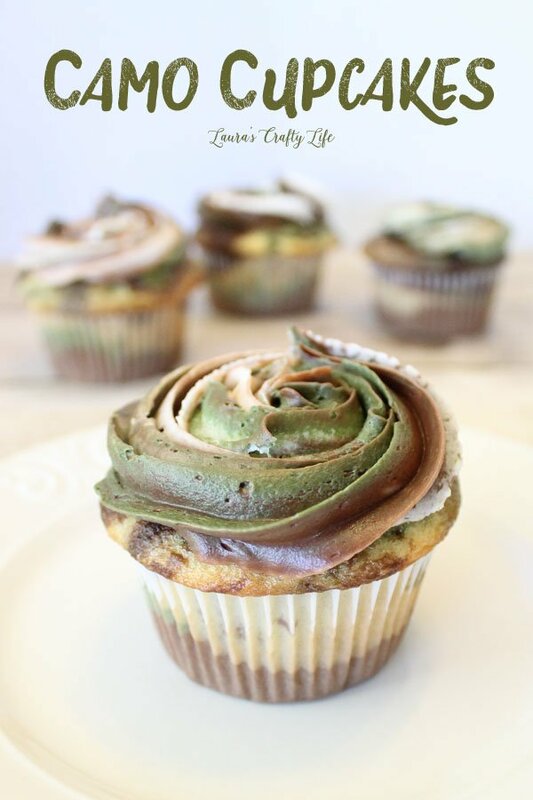 Today, I am going to share with you how to make them. I didn’t plan an elaborate party like I usually do for the kids, but I did decorate and we had a lot of delicious food. We ended up playing Just Dance, which was hilarious! I purchased some decorations at Walmart – camouflage plates, napkins, balloons and a tablecloth. I also made a utensil holder by using a cardboard beverage carrier and covering it in camouflage Duck tape. 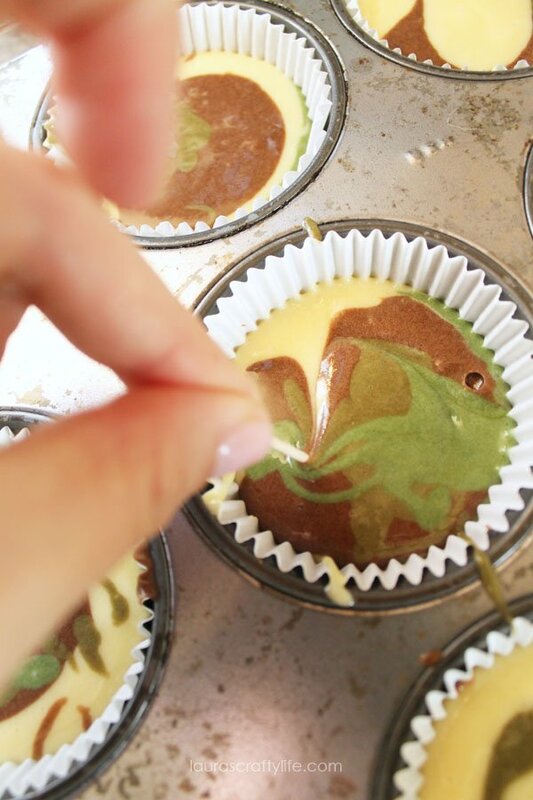 To make the camouflage cupcakes, you will need to purchase three different kinds of cake mix. Chocolate, yellow, and white. 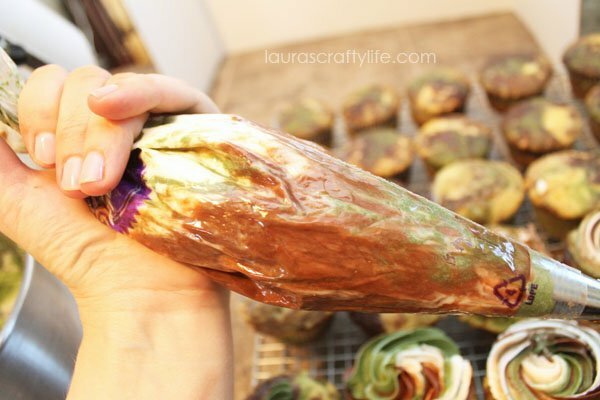 You will also need two colors of food coloring. 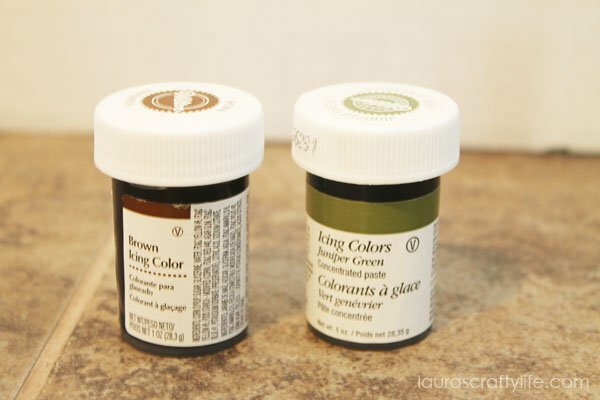 I prefer to use the Wilton colors when I am baking cakes or making an icing. For this project, I used Brown and Juniper Green. 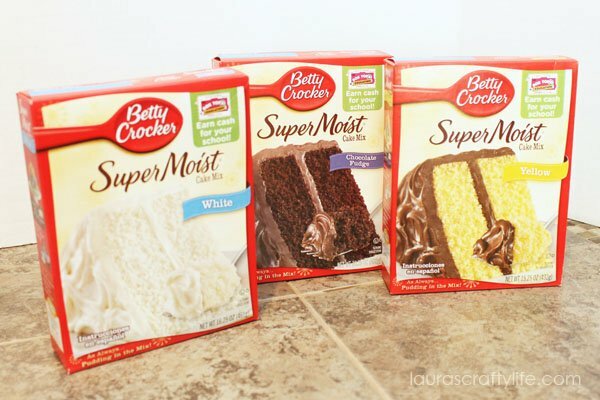 Prepare each cake mix according to package instructions. 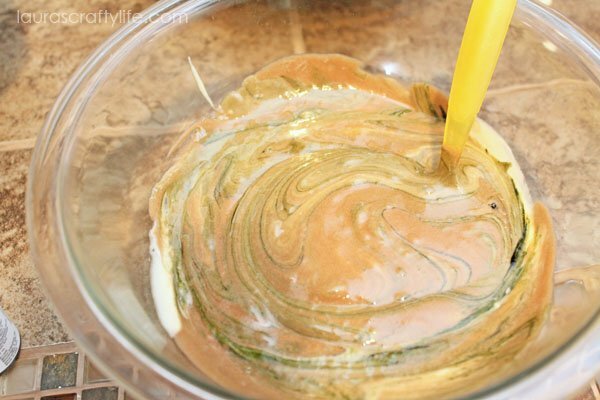 I wanted five different colors of cake batter – dark brown, light brown, yellow, dark green and light green. 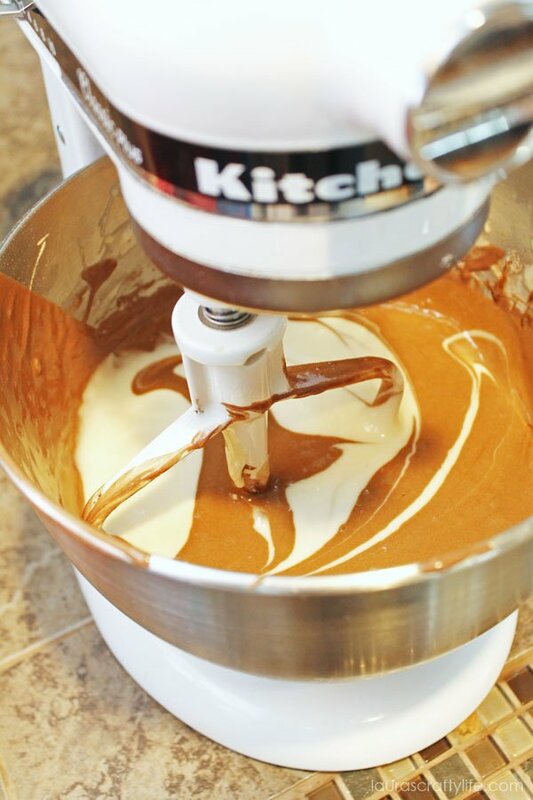 The dark brown cake batter was simply the chocolate cake batter by itself. 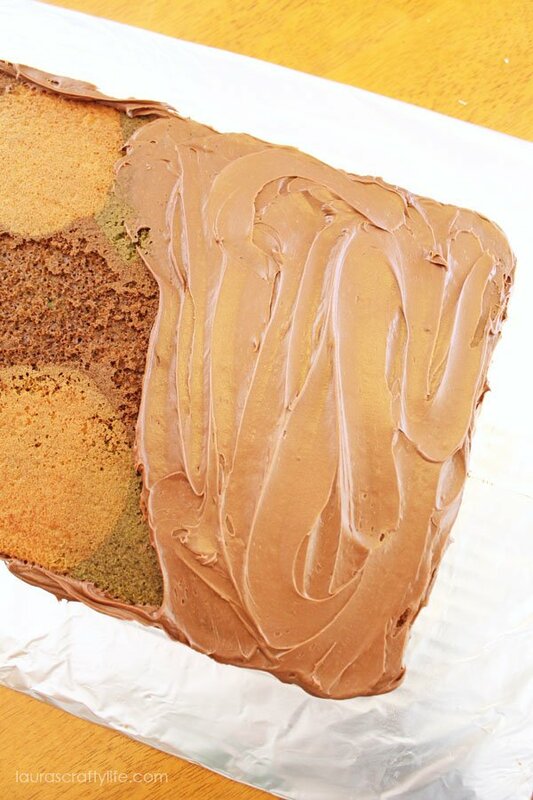 To make the light brown, I mixed the white and chocolate cake batters together. 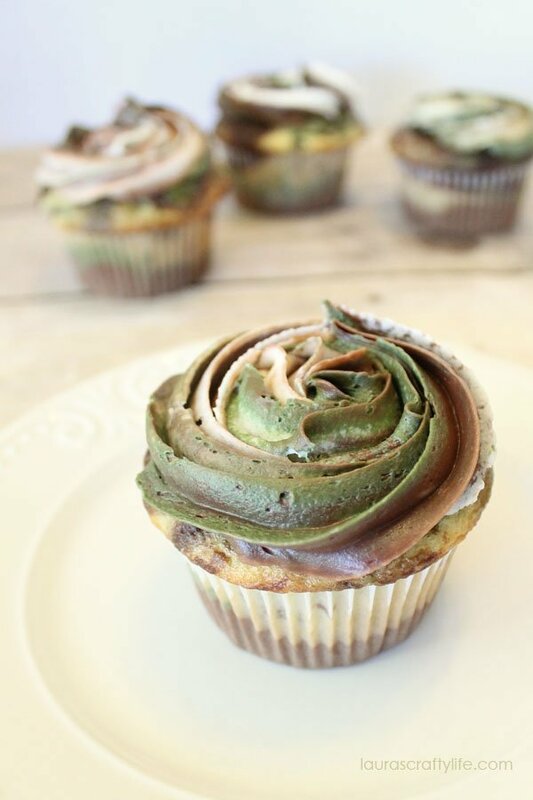 For the green batters, I used some chocolate batter mixed with the green food coloring to create a darker green. 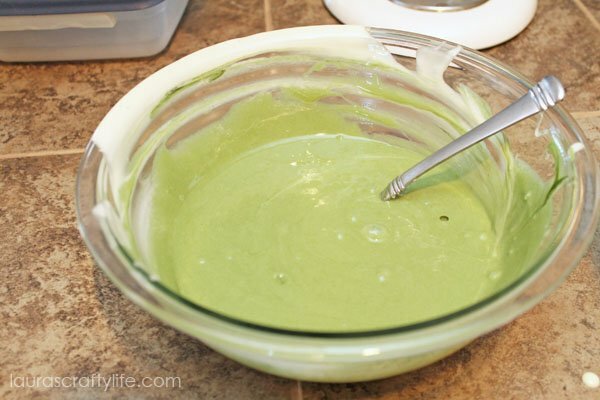 For the lighter green, I mixed white cake batter with green food coloring. 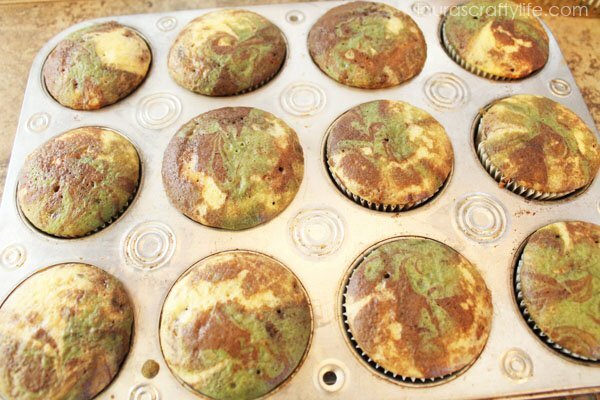 To make the cupcakes, I used a spoon to drop some of each of the colors of cake batter into a muffin tin lined with cupcake wrappers. 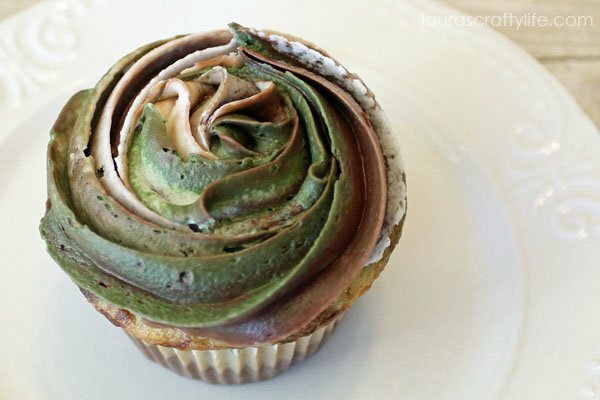 I then swirled the colors together, just a little bit, using a toothpick. Bake the cupcakes according to package instructions. Allow to cool. I made my usual buttercream frosting. 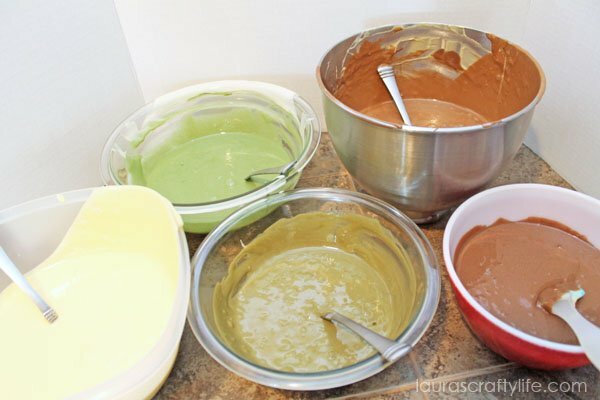 I divided the frosting into three bowls and colored one green, one brown and left one white. 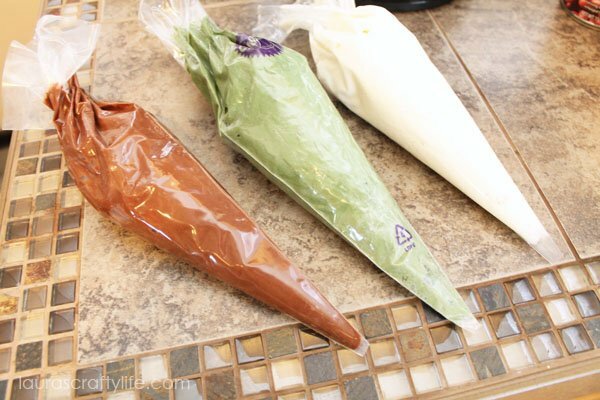 I added each of the three frostings to a piping bag. 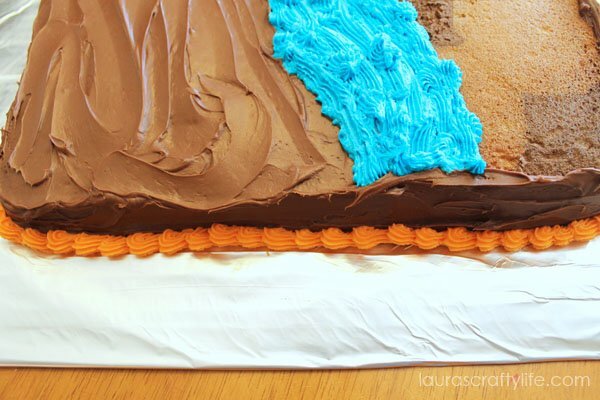 Note: I found a tutorial showing how to place all three piping bags into a larger piping bag to create the swirl effect with the frosting. I could not get this to work for me, so I simply squeezed a little bit of each of the three colors of frosting into a large piping bag, and alternated colors up to the top. Using a large star tip, I added frosting to each of the cupcakes. To display the cupcakes I used my white cupcake stand. I covered each tier of the stand with moss you can find at the craft store. I then placed the cupcakes on the moss. I love this cupcake stand. When not in use, you can disassemble it and it takes up much less space! 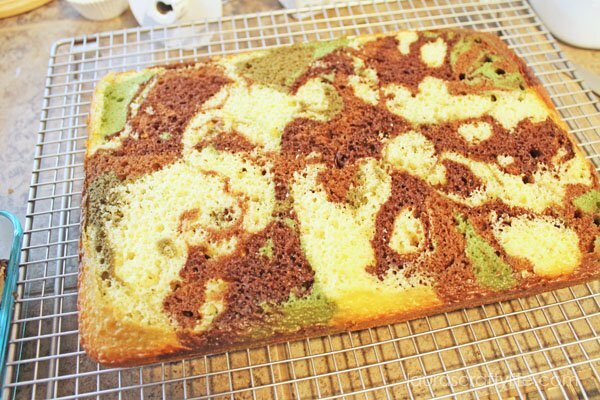 I also made a camouflage cake. To make the cake, I used the same cake batter as above. I dropped spoonfuls of the different colors of batter into a greased rectangular baking pan. I didn’t swirl the batter colors this time. I did make sure that I had a pretty even distribution of all the colors of batter. It turned out really cool once it was baked. To frost the cake, I used pre-made chocolate frosting and frosted the sides and top one-third of the cake. 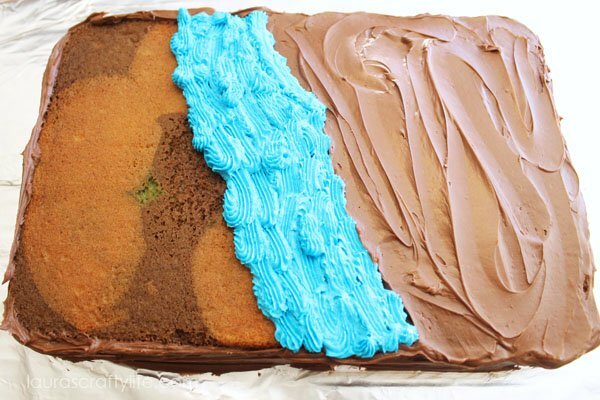 I added blue buttercream icing using a star tip to create the look of water on the middle third of the cake. I used orange buttercream icing around the edge of the cake and also to write Happy 4oth Birthday on the cake board. 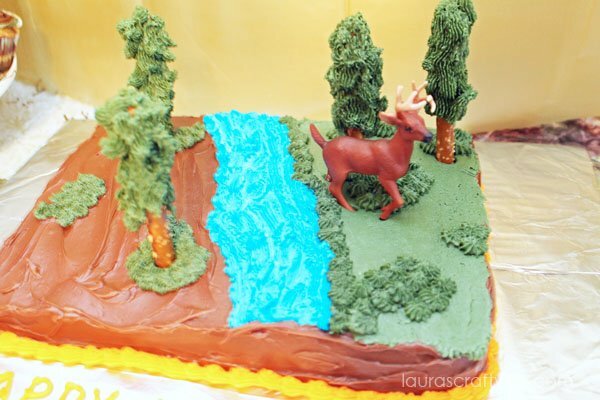 Lastly, I added green buttercream icing to look like grass. I added large pretzel sticks covered in green icing to look like pine trees. And I added a small plastic deer. I somehow did not get too many great pictures of the cake or the party. I think we were all having too much fun! 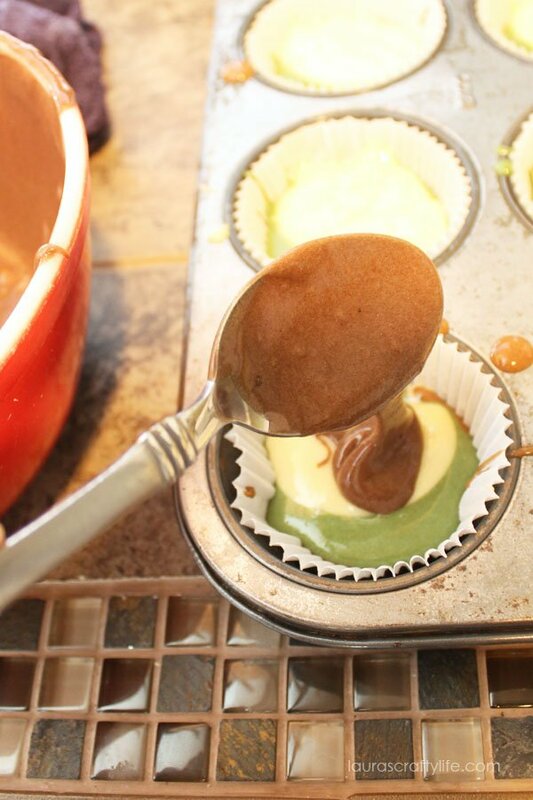 Have you ever made a cake or cupcakes using multiple colors of batter? 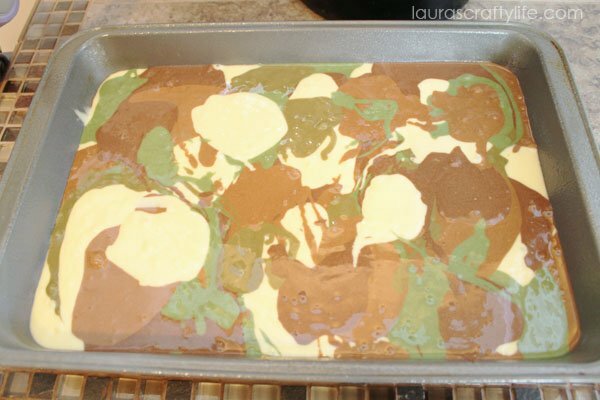 You can find more ideas on my Camo party Pinterest board.